For outdoor enthusiasts visiting Vietnam, one place that must be visited is Ba Be National Park. This gorgeous slice of landscape tucked into the northeast province of Bac Kan has something for everyone to enjoy. Meaning “Three Lakes,” Ba Be boasts the largest freshwater lake in the entire country with the three parts of it known as Pe Lu, Pe Lam, and Pe Leng. While it is the central focus of the park, the mountain peaks of the Pia Booc mountain range and the lush forests that surround it add to the stunning serenity of this place. There are many activities you can enjoy while in Ba Be National Park. Exploring them in the way that best suits you is encouraged. Here are some of the things you should consider trying during your visit. 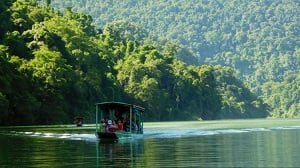 Take a boat trip to truly experience the magic of Ba Be National Park. If you’re more adventurous, you can take a kayak to explore on your own, or join the boat tour if you’d rather. Either way provides a spectacular way to discover the majestic surroundings. In the middle of the lake sits Widow’s Island, another place that will have you mesmerized with its natural beauty. While out on the water, you’ll want to see An Ma Temple. It’s right next to the lake and offers a prime place to embrace the serenity of the area. You’ll also get the chance to learn about the local people, their religion, and their rituals. Ba Be National Park also has many caves. Among the most notable is Puong Cave. 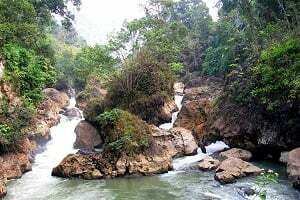 It’s at the bottom of Lung Nham Mountain and formed by erosion from the Nang River. You can explore it by boat. Wafting into the darkness, you’ll soon discover a stunning scene filled with stalactites and stalagmites, as well as 18 different species of bats. 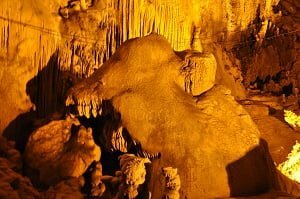 Hua Ma Cave is another one that’s spectacular and comes with an incredible folklore story that your guide will surely share with you. Not far from the lake, you won’t want to miss the breathtaking waterfalls. You’ll see the water turn from green to white, crashing from the rocks above and falling below, a calming and gorgeous sight to behold. If you’re lucky, you may even see a rare species of fish called Ca Chien, some of which are quite large in size. The variety of ethnic villages populating in and around the park make for a wonderful chance to get to know the cultural side of things. Tay, Dzao, and H’mong are the different types of people you’ll find here with their welcoming villages. You’ll find them crafting canoes, farming, fishing, and more. It’s a fascinating slice of Vietnam you’d be sorry to miss out on. That’s especially true when it comes to the food. You won’t have a fresher or more authentic meal in the country. If you’re lucky enough to be at Ba Be National Park during one of the big festivals like the Long Tong Festival on the 9th and 10th days of the first lunar month, you will truly get to experience the best of the culture. 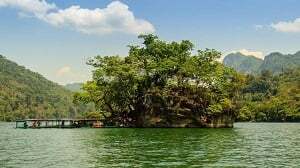 Ba Be National Park should be on everyone’s itinerary when they come to Vietnam. For it’s splendid sights, outdoor activities, and cultural experiences, it is unforgettable.